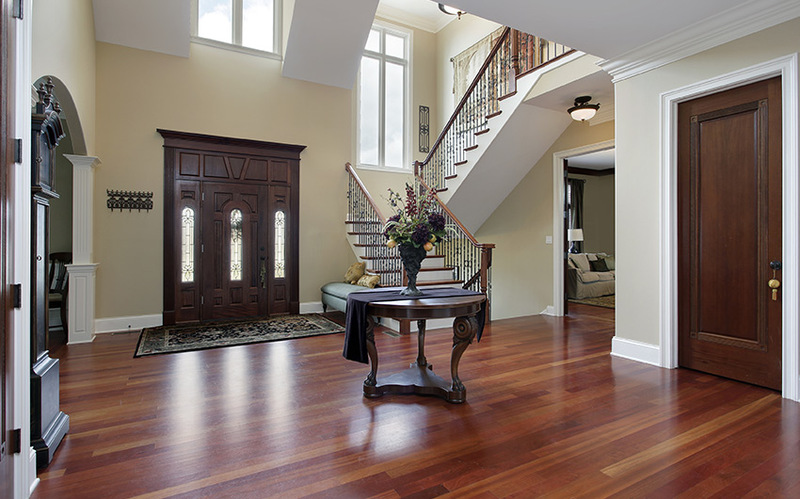 Everyone’s front foyer is different because room sizes and layouts vary. 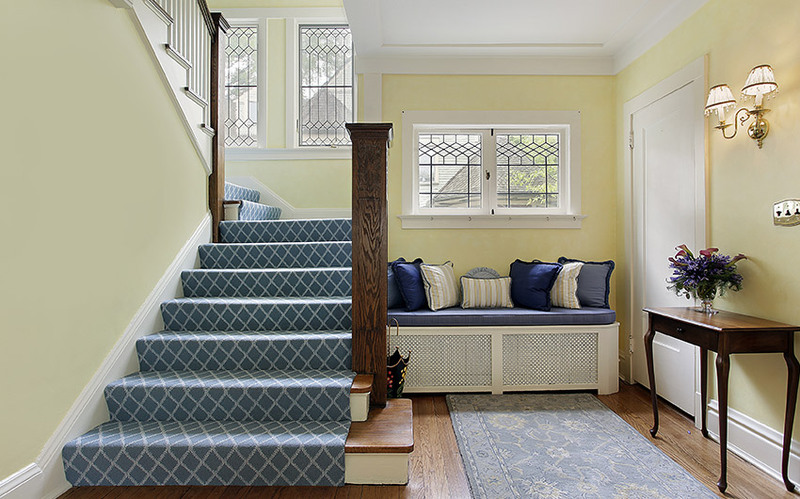 The larger your foyer, the more options you have, but a smaller foyer can still become a cozy and welcoming entrance. It just takes proper planning and a more careful selection of furniture. When coming up with your foyer design, be sure to choose functional furniture, introduce a splash of colour and transition the style to the rest of your home. Your front foyer is the perfect place for stylish yet functional furniture. Small dressers with drawers for keys, gloves and warm clothes are helpful near the door. Chairs or a bench are also helpful when you need a seat to put on your shoes. Mirrors are useful for one last look at yourself before you leave. They can also make a small space appear larger. So many different types of décor work in this space. Beautiful wall art, quality souvenirs and family photos are all suitable, especially if they have a personal touch. A standing hat rack is a functional piece of décor that can be found in many different styles. A houseplant can really liven up the space and introduce nature into your foyer design, if your entranceway is large enough. No matter what furniture or décor you choose, it’s important they never block people from walking through your room. A small entrance needs to be as easy as possible for people to use. A larger entryway allows for more versatility, but it’s still important to make sure your furniture isn’t bulky or oversized. When coming up with your foyer design, you should introduce bold statement colours in your furniture and decor. No one likes a dark, drab room, but it’s especially important with tight spaces. As the first and last place guests will see in your home, it should give them a strong first impression and leave them with something to talk about. Try placing a rug in your foyer. It’s the perfect way to introduce a new pattern, reinforce a colour palette, and add softness to an angular room. If you want it to last, your rug must be durable. Unlike a living room rug, people will be walking on it regularly, and in the winter months, it’ll be crusted with snow, ice and slush. Your walls are no different when it comes to introducing bold and exciting colours. They should be painted in a style that complements your furniture and décor. Wallpaper is also a good idea for a front foyer. It’s a great way to add patterns and interesting styles. Your front foyer is the first experience your guests will have inside your home, so the décor should work with what lies ahead in the other rooms. It should also be a transition from the outdoors. This is a good place to introduce houseplants, stones, and nature-based décor. To make your foyer a welcoming place, choose functional furniture, introduce exciting colours, and transition the style between different areas of your home and outdoors. 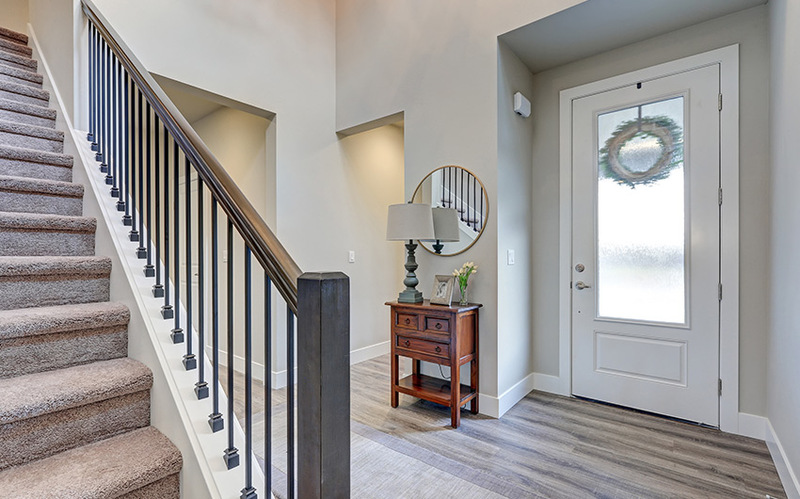 Putting effort into your front foyer means coming home to a gorgeous, calming style after a long day at work. You’ll notice the difference the moment you walk in.